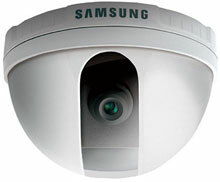 The Samsung SCC-B5301 Color has been discontinued. No direct replacement is available. The Samsung SCC-B5301 Color camera is capable of superb observation, thanks to its state-of-the-art implementation of 1/3" CCD 410,000 pixels (NTSC), and 470,000 pixels (PAL) at an economical price. (B5300 (G) (P): 270,000 pixels (NTSC), 320,000 pixels (PAL)). B5300 and B5301 models: both equipped with a 3.8 mm (focal length) lens and optical low pass filter, they can be used at ordinary places. B5303 model: equipped with a 2.9 mm (focal length) lens and optical low pass filter, it can be used in small spaces like an elevator. B5305: equipped with an 8.0 mm (focal length) telephoto lens and optical low pass filter, it can be used in long and narrow spaces such as a corridor.